The main function of a kitchen is serving as a location for storing, cooking and preparing food (and doing related tasks such as dish-washing), but it may also be used for dining, entertainment ,laundry much more. Often the hub of the family home, the kitchen is a place to gather, cook, eat, laugh, do homework or pay bills, and share in special moments together. When space is limited, it takes smart planning to create a multi-functional and aesthetically appealing kitchen. At Simplinteriors school of interior design we teach our students that designing a small kitchen is often a little more complex than designing a larger kitchen space and requires the skills of an interior designer (which they will soon be after completion in Simplinteriors school of interior design). Interior designers who have passed through an interior design training school have walked along the design path many times and have priceless experiences will understand quickly the layouts of kitchen spaces and decorations. They help to speed up the rigorous process by helping to get cheaper but quality kitchen materials from their several professional contacts. 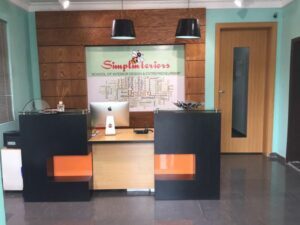 Many people living in Lagos may look at hiring an interior designer to style up their kitchen spaces as being far fetched as it may involve high charges which is a good point but that is where great schools like Simplinteriors comes in. 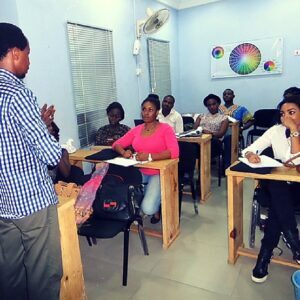 Simplinteriors school of interior design here in Lagos helps to equip individuals with these skills to be their own boss. Think wider, move at your own pace and get the satisfaction from designing your own living space. 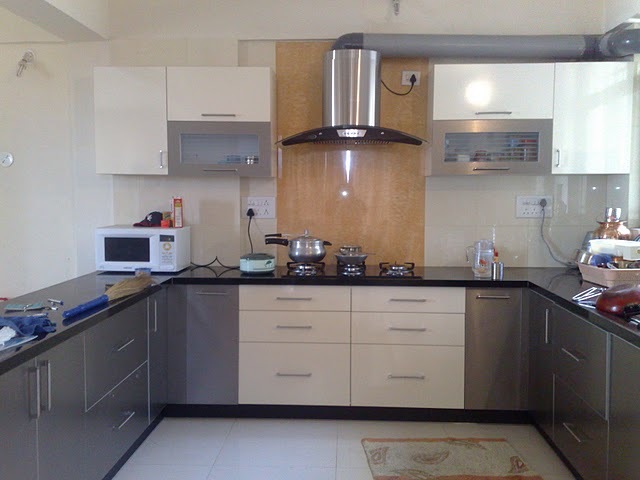 Now I am going to share with you several tips to designing a small kitchen space. 1 When designing a small kitchen space, take every inch of space into consideration. You are advised to use cabinets with glass doors so you are able to see what items you have inside. 2 In a small kitchen, counter tops space is very limited so adding a high shelf takes stuff off the counter and upwards. The shelf can be 22metres above the counter rather than the standard 18metres so if you working on the stove nothing is right in your face. 3. 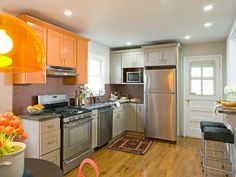 Bright orange cabinets move the eye around the room, a trick to make the space appear bigger. 4. A small kitchen that has an island must also be multi-functional, The drawers should house dishes, cutleries and other household items that couldn’t fit in the cupboards. 5. 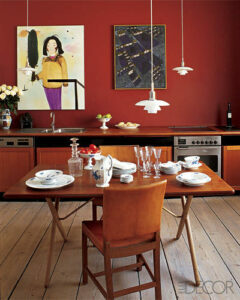 The color of wall paint used in a small kitchen is very important. It is advised to use lighter colors to give a softer outlook and make the small space look brighter and bigger. 6. The minimum distance between the wall cabinets and the island should be atleast 3 feet in other for the kitchen space not to look al choked up and you have enough room for traffic and mobility. 7. 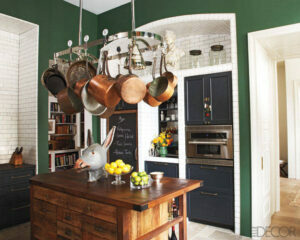 Island Storage: Hanging pots has been seen in the western culture as attractive when done correctly in the kitchen. Hanging them directly above island is a unique but yet welcome idea. It helps to maximize unused space. 8. Maximizing the space in a small kitchen is key so it is advisable to avoid unnecessary items laying around hence the kitchen cabinets in a smaller space must be multi-functional meaning it should hold cleaning items like refuse bins, sponges, nail brushes etc. having a storage function. 10. Paint inside the cupboards: It is also a great idea to distract the eyes by concentrating the focus to another or several parts of a kitchen. This can be achieved by making the cupboard the focal point of attention. 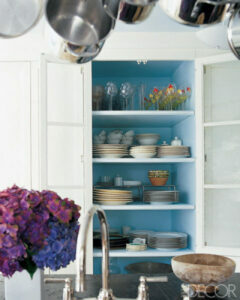 The cupboards light blue backing draws the eye directly to the statement items.